On Monday, 21 August, an historic solar eclipse will be taking place across much of North America. And with its location along the celestial event’s trajectory and expansive views in the Laurel Highlands, Kentuck Knob will present a great vantage point to take in the sight. 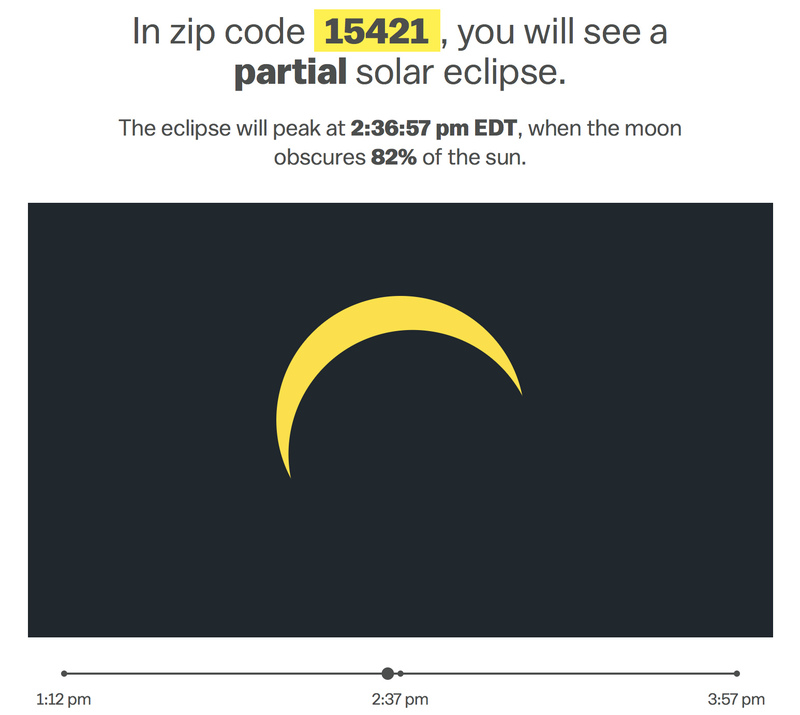 Find out Kentuck Knob’s 82% obscuration of the sun compares to what’s visible in your zip code like the above image with the tool from Vox. If you plan to join us on this coming Monday, be sure to take a look at advice on the best method for viewing the eclipse and plan accordingly to properly protect your eyes. As of this post (18 August), tickets are still available for Guided House Tours during the eclipse times, so book yours today! If you prefer to just see the spectacle, a Woodland Walk ticket might be right for you, too. Remember, you will need a ticket to see the eclipse on the grounds after either a house tour or during your woodland walk. Regardless, we hope you enjoy this wonder of the cosmos wherever you happen to be on Monday!